Timing the market is difficult. If it were easy, everyone would do it. That’s why many traders turn to technical analysis for an edge. All any trader has is the left side of the chart (past) to try and determine the right side of the chart (future). Fortunately, all markets are essentially comprised of human behavior; therefore, markets have memory. It’s this memory that comprises a basis for support and resistance zones. For example, large candle wicks (pricing trends representing the psychology of participating traders) can reflect emotional, exuberant and irrational human behavior which is exhibited either by buying beyond the sustainable market price, or by selling far below fair market value. Let’s paint some support (green) and resistance (red) on the current weekly chart. I’m using Brave New Coin’s $BLX index, which aggregates all bitcoin markets globally. 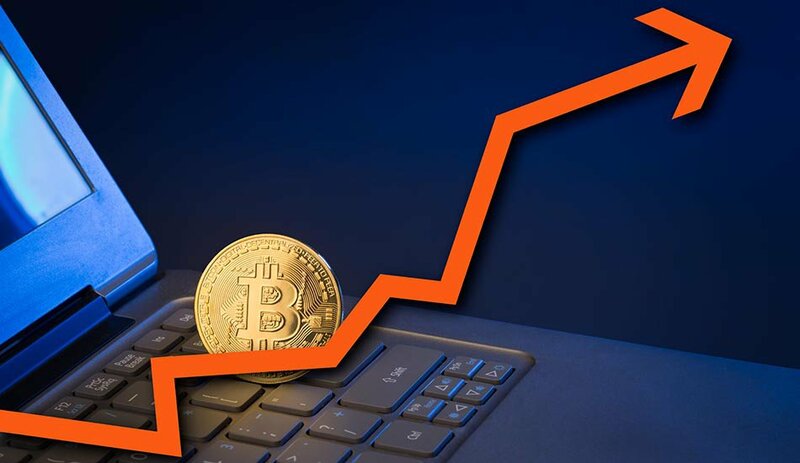 Bitcoin is in a current state of upheaval because of fluctuations in the rankings of countries and exchanges with the highest trading volumes, the most liquidity, the optimal signals to follow and the highest probabilities of where price may go in the future. Aggregating all the data between the currencies and exchanges in one index means better signals and more realistic, fair-market prices. I’ve added zones of resistance (red) at the All-Time High (ATH) candle wicks from 2013. This is where one might expect selling, based on prior price history. Price is currently in this large zone of heavy resistance, so one would EXPECT large amounts of volatility and repeated attempts to, with steadily increasing momentum, break the previous ATH. This zone represents previous irrational exuberance where some buyers were inevitably trapped in a position. If those buyers have not already sold, many will be looking to sell bitcoin at break even. The trend is your friend, right until the end. Luckily, bitcoin is currently in a multi-year bull trend as exhibited by this weekly chart. Don’t fight the trend! Meaning, you’ll make more money going long or buying than you will going short, or selling. Investors, those with a longer timeline, look for growth opportunities like this, ideally at the bottom of the trend; whereas traders, who are often in and out of a trade within hours, days or weeks, can find a way to make money in any market. You’ll also notice a zone of support, which had previously been resistance, represented by the large candle wick in April 2013. Once this resistance broke convincingly in October 2013, bitcoin entered price discovery mode, searching for a new ATH in parabolic fashion. Once established, support was rechecked months later, which held, paving the way for the beginning of a new bull trend. There is also a yellow line representing 50 percent of the entire distance between established support and resistance. 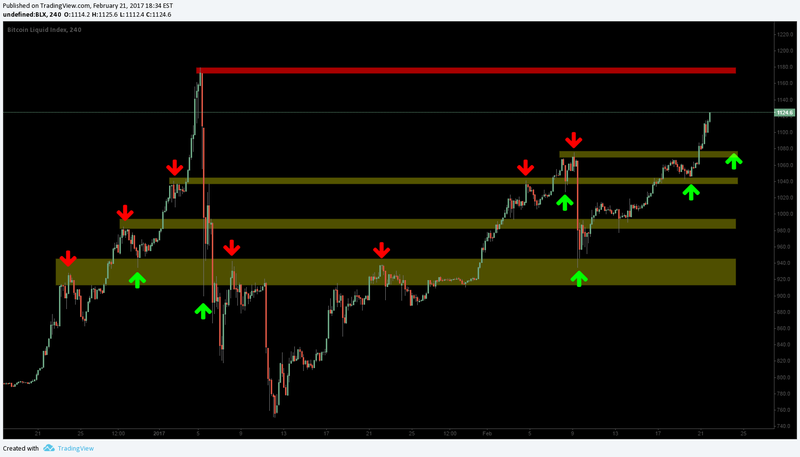 This is a key zone which helps determine whether or not support or resistance will be tested. If price holds above or breaks 50 percent of the resistance and support zone, there is often a test of the resistance zone. If price holds below or breaks 50 percent of the resistance and support zone, there is often a test of the support zone. This is known as Dow Theory, which essentially states that any large price move will retrace 50 percent of the move and make a decision from there. 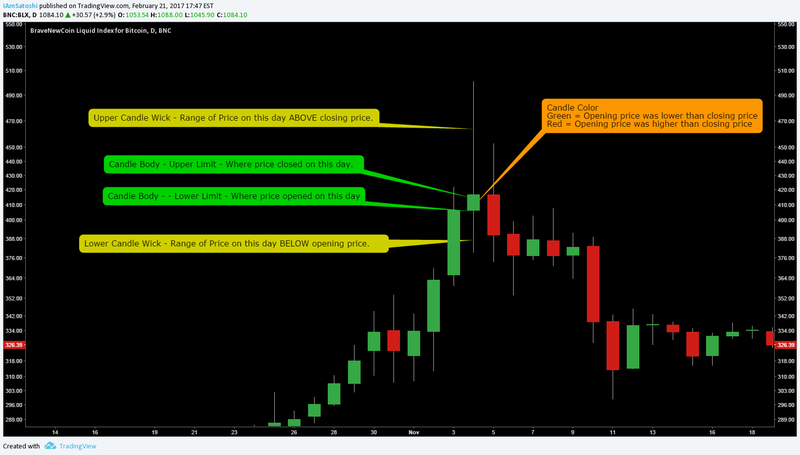 Here are those same principles applied within the macro trend on the daily timeframe. We can convincingly see that with each test of support, price has bounced higher and proceeded to break the previous local top, or resistance. This is exactly what to look for in an established trend. You’ll also notice that the 50 percent zone often gets rechecked as support. If previous resistance, turned support, fails to hold as support, then the entire trend is in jeopardy. Additionally, my revised Dow Theory holds true except in the case of January 2016 when support was not tested again for the second time. Currently, price is attempting to reach for a previous local high, which also represents price near ATH. If/when ATH does break, the market reenters price discovery mode, which may or may not occur in a parabolic fashion, similar to 2013, albeit unlikely. Without getting too technical, there is confluence of resistance at ~$1800, which would be a definite take profit target as a trader. 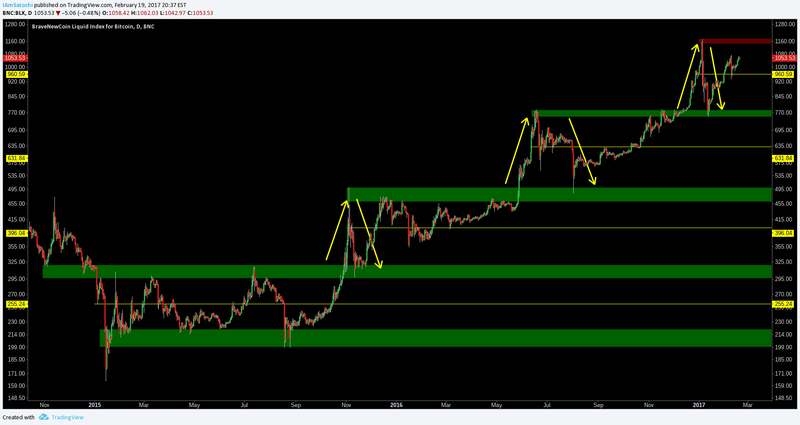 This can be determined by adding 50 percent above the current zone of resistance at ~$1200. Each move upward in the current trend has yielded a 50 percent move or greater. 3. January 2017 - 51 percent move from previous resistance. 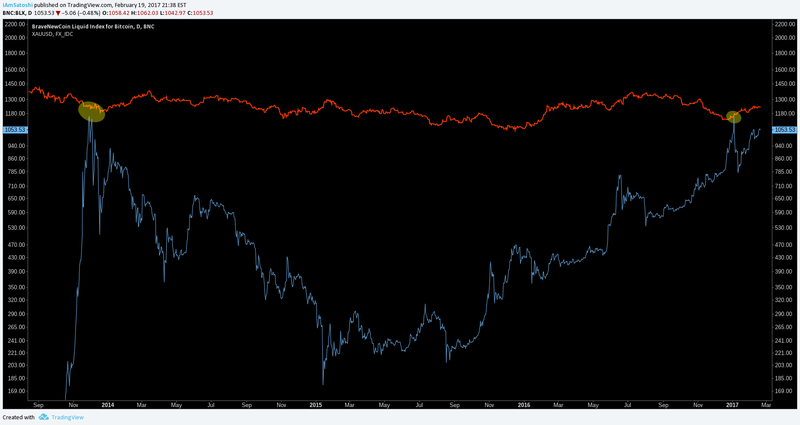 An interesting point of psychological resistance has been the USD price of gold, relative to bitcoin. In 2013, during the parabolic price discovery phase, the established high was ultimately slightly lower than the current price of gold ($XAUUSD) at the time. This may have been just a coincidence until it happened a second time in January 2017. 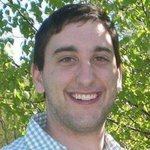 Whether or not bitcoin can truly become “digital gold” from a price perspective remains to be seen. Currently, on the four-hour timeframe, there is no immediate resistance until the previous local top at $1173. We can also predict that previous resistance of ~$1077 is now support, until proven otherwise. So should price pull back, this would be the immediate target. 1. All markets have memory and because of this, traders can use the past history of support and resistance to predict future support and resistance with a high probability. 2. Bitcoin price is an ongoing multi-year bull trend. 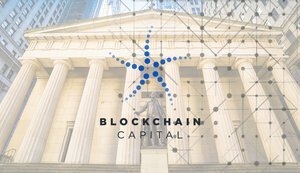 Price is leaning heavily bullish in the near, medium and far term with a realistic target of $1800 within the coming months and definitely within the next twelve months. 3. The psychological barrier of the previous ATH, as well as gold parity, are two of the closest checkpoints before “price discovery” mode beyond previous ATH. 5. After the blow-off top, expect a retest of previous resistance of ATH at $1176, which would then be support.